The Irish Times’s tolerance for pseudoscientific health claims has been discussed here before. This week, as if responding to an impulse, the Times again published a controversial health story under the guise of grassroots health activism. 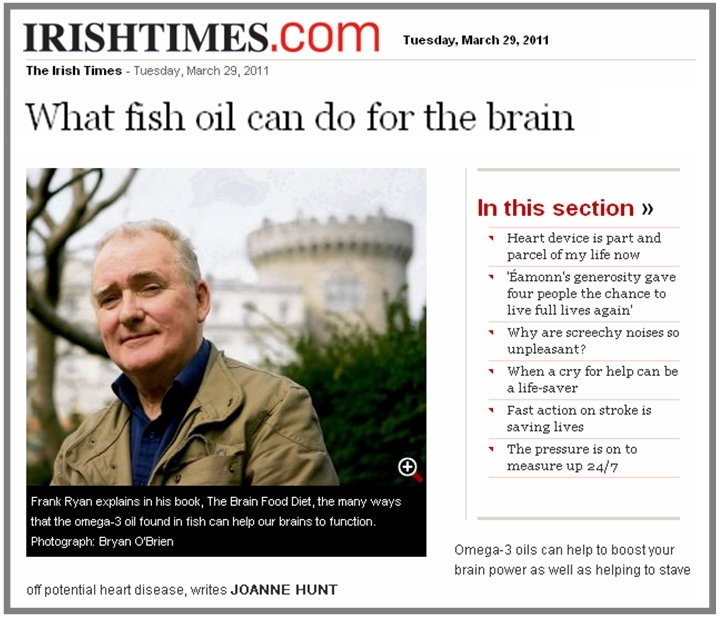 On this occasion, the Times are promoting the claim that omega-3 fish oils have significant positive effects on cognitive function. Filtering out the elements of text that are framed to flatter fish oil guru Frank Ryan (a man who derides as capitalism the role of the pharmaceutical industry in healthcare, while nonetheless appearing in the national media to promote sales of his book), we are left with three major substantive claims: firstly, that consumption of fish oil “will reduce your risk of a cognitive decline”; secondly, that fish oil “[will] reduce the risk of Alzheimer’s disease by almost 50 per cent”; and thirdly, that “you can never be too young to take omega-3”. Ryan asserts that each of these claims reflects the latest scientific research. Actually, none of them do. The claim that fish oil “will reduce your risk of a cognitive decline” has been tested across a number of studies. There are some suggestive animal trials indicating that elements of omega-3 fish oils (such as polyunsaturated fatty acid) may alter behaviour in rodents, but this hardly constitutes a demonstration of effects on cognition in humans. The latest statistical review of the accumulated evidence (updated in January 2011) concluded that “There is no evidence that dietary or supplemental omega 3 polyunsaturated fatty acid (PUFA) reduces the risk of cognitive impairment or dementia in healthy elderly persons without pre-existing dementia”, although this was primarily because all previous research to date has been methodologically flawed. The claim that consuming fish oil “[will] reduce the risk of Alzheimer’s disease by almost 50 per cent” almost certainly relates to a 2006 study reported by a group from Tufts University of Boston in the Archives of Neurology. These researchers reported analyses from a longitudinal epidemiological study (actually, the famous Framingham Heart Study) in which 899 healthy men in their 70s completed a diet questionnaire and provided blood samples from which levels of the omega-3 fatty acid, docosahexaenoic acid (or DHA), were derived. The men were followed up between 2 and 16 years later, at which stage 99 of them had developed dementia (71 of whom were cases of Alzheimer’s disease). The researchers reported that the men in the top quartile of DHA levels were 47% less likely to develop dementia than the men in the other three quartiles. This is where Ryan gets his figure of “almost 50 per cent”. However, there is an important caveat. The figure relates to all-cause dementia, not to Alzheimer’s. The equivalent analysis for Alzheimer’s found no statistically significant differences. The Framingham questionnaire data also showed that DHA levels were correlated with average consumption of fish (or of other DHA-containing products). From this, you may be tempted to draw a tentative conclusion that fish/DHA consumption is somehow linked to dementia. However, you don’t need to rely on tentative inferences: the dataset allowed the researchers to test this theory directly. When the researchers attempted various analyses in which the dementia rates of the top fish eaters were compared to those of other men, none of the analyses yielded a statistically significant effect at all. In other words, while DHA levels were correlated with diet and dementia, fish consumption was not correlated with dementia. So however you might interpret the effect relating to natural blood plasma levels of DHA, there was certainly no evidence supporting Ryan’s claim that eating fish will reduce the risk of Alzheimer’s disease. Finally, Ryan’s claim that fish oils are good for children’s cognitive function (as in “you can never be too young to take omega-3”) also lacks empirical support. Most of the studies to date fail to control for confounds such as parental treatment of children over and beyond feeding them fish (or fish oil supplements). Fish-eating children tend to come from health conscious families, who cultivate home environments that are conducive to a range of positive child outcomes. When methodological controls are introduced (such as when researchers employ designs that are randomised, double-blinded, and placebo-controlled), effects for fish oil disappear. In fact, one recent such study found an effect for placebo fish oil. One indicator that Ryan is willing to play fast and loose with scientific issues is the fact that he deploys an argument about patents that is an old favourite of quacks and pseudoscientists alike. According to Ryan, the pharmaceutical industry is against fish oils because, as they are naturally occurring products, Big Pharma is unable to patent them. However, this is a nonsense argument. Firstly, megacorporations in various sectors frequently make enormous profits from naturally occurring products (for example, the global caffeine industry turns over nearly $1 trillion a year). Secondly, it is untrue to claim that pharmaceutical companies are not interested in products they can’t patent. Aspirin, a naturally occurring substance that cannot be patented, is one of the most profitable pharmaceutical products ever. In short, if fish oil had the cognitive effects described by Ryan, you can be sure that Big Pharma would be very interested indeed.